Camden County Prosecutor Mary Eva Colalillo is proud to announce the promotion of Ron Moten to Chief of Detectives. Chief Moten has served his entire 19-year career in law enforcement with the Prosecutor’s Office. He was sworn in at the Hall of Justice on Wednesday before a courtroom packed with his family, friends and colleagues. Retired Superior Court Judge Isaiah Steinberg, who mentored the chief when he was an intern, traveled from Florida for the ceremony. A native of Clearwater, Florida, Chief Moten attended the University of Florida, where he was a linebacker for the Gators football team. A standout on the gridiron, he was drafted by the Philadelphia Eagles in 1987. After a series of injuries cut his playing career short, he made the most of a second chance and enrolled at Rutgers University-Camden. He earned a psychology degree, found his calling as a lawman and joined the Prosecutor’s Office in August 1995. Chief Moten began as an investigator on to the Trial Team Unit and later served in the Juvenile Unit before being assigned to the Narcotics Unit from 1997 to 2000. He spent about a decade in the Homicide Unit and handled numerous difficult cases. He was promoted to the rank of sergeant in 2007 and served as a supervisor with the Trial Team and Homicide units. He went on to became a lieutenant and supervise the Major Crimes and Child Abuse units. He was later promoted to captain, a role in which he oversaw the Homicide, Narcotics, Trial Team and Grand Jury units. He rose to the rank of deputy chief in 2014. 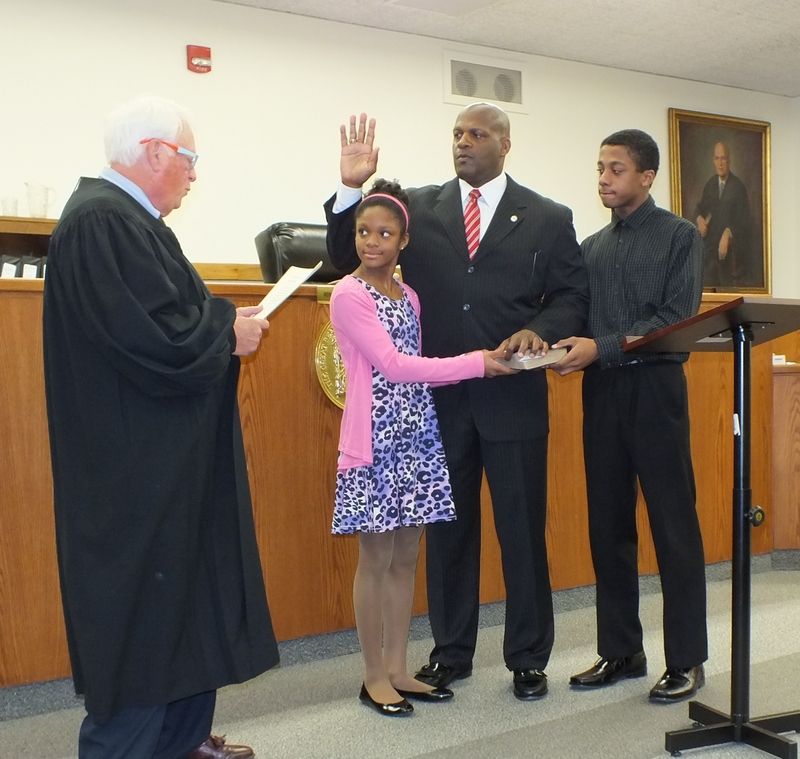 Ron Moten was sworn in as Chief of Detectives for the Camden County Prosecutor’s Office on Wednesday, April 1, 2015. Standing with Chief Moten are his daughter, Madison, 10, and his son, RJ, 12. Retired Superior Court Judge Isaiah Steinberg, who mentored Chief Moten, is pictured on the left. Released Wednesday, April 1, 2015.